As a company that provides air-conditioning, construction, design, water supply, sanitation, and maintenance, we can make contributions to evironmental protection by utilizing the “3L”s. The 3Ls include the social responsibilities involved with LCS (Life Cycle Support) for related products, the environmental principals of minimizing LCC (Life Cycle Cost), and to better the “Life” aspect of all people through corporate activities. To improve LCS, we work dilligently to improve the quality of our support through regular checkups on the properties we have constructed. To continuously identify and measure LCC, while striving to increase positive envronmental contributions. To determine the National policy and future possibilities, we will propose initiatives in anticipation of future trends. To inform and engage the public in our corporate activities in order to contibute positively to society. To be thoroughly aware of internal environmental quality by enhanced training activities. To strive towards continuous improvement of our quality environmental management system to prevent pollution. To always remain in compliance with requirements and agreements such as laws, ordinances, and regulations. Proposals for energy savings and CO2 technology to provide cost reduction and customer satisfaction. To always possess the training and technical capability required to provide quality products and services, and gain your trust and satisfaction. Promote energy efficiency and resource conservation. Promote recycling and thorough management to reduce industrial waste. Set regularly reviewed environmental objectives and benchmarks for our business activities. 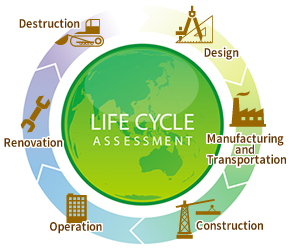 Lifce Cycle Assessment is a methodology indended to asses environmental impact of a product from its inception to end-of-life. It takes into account everything from the raw materials consumed in production, the impact of its distribution and operation, and the costs it will incur at its disposal. In Japan, 40% of total CO2 emissions are construction-related. In addition, the air-conditioning and sanitation equipment in a normal building accounts for 40% of its total energy consumption. In order to understand and minimize our environmental impact, Fujinetsu proposes that all future construction and renovation projects implement a running cost comparison of CO2 emissions, a major cause of global warming. It will include an LCA calculation comparing the CO2 emissions of current infrastructure to those after the proposed project completes. Moving forward, we will be able to more accurately understand how we affect the environment, and will create, spread, and promote greener environments and high-technology. 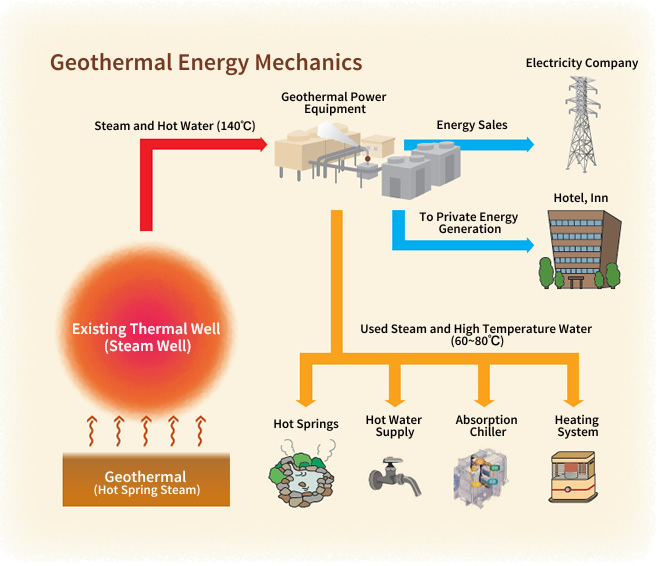 A new energy company, Western Japan Geothermal Power, (4 companies with 51% ownership) has been established in that utilizes FIT (Feed-in tariffs) for renewable, geothermal energy. Through complete utilization of heat generated by the hot springs, no new CO2 is generated, and heat is not wasted. We will protect the environment and contribute to the community through the reduction of CO2 emissions by using the “Cascade” in stages. To maximize resource efficiency, resource utility can be divided into multiple stages rather than just a one-time use. When a resource is used, waste and byproducts are produced, which can then also be utilized as resources for other purposes, resulting in a "Cascade" of use that can continue for many iterations.